The famous temple of Maa Olasuni became illustrious due to famous Odia Saint, Religious Writer and Philosopher Arakshit Das in around 1835. The temple situates on a hilltop and cave of Palai Mouza, Badachana Block of Jajpur District. The famous writer, philosopher and saint Arakshit Das has rested his soul (Atma-Samadhi) on Jan-19 of 1837 (Magha, Krushna, Ekadashi). Then onwards on every year the ‘Olasuni Cave Festival’ takes place here for a week-long. To know complete information about it and how to get there easily, read this article. The Saint Arakshit Das (alias Yuvaraj Balabhadra Dev) was born to Badakhemundi (undivided Ganjam’s) Royal Family in Ganga Dynasty in eighteenth century. As he is very fond of religious practices and God-loving person he travelled throughout the Kalinga (Orissa) to get a perfect place for meditation. He went to famous Shakti Peeth of Sarala, Jadupur, Paradeep, Sandha Raja of Kujanga and many more places; but after frustration and chaos he came to Olasuni Cave; which was under famous Ruler Radhashyam Narendraof Kendrapada. He kept his request and allowed to stay there. He then started worshiping the Goddess and meditates there. Once in a dream, Olasuni ordered to play the flute which he brought from Brindaban. When Arakshit Das played the flute, Goddess Olasuni pleased and came down to the bottom of the hill. On Magha, Krushna, Ekadashi (the day 19th of January 1837) Shri Arakshit Das rested his soul in the cave while meditating. Since more than hundred years the ‘Olasuni Cave Festival’ occurs every year to worship the Goddess and to keep memorizing the famous Saint Shri Arakshit Das. During the festival, for a week-long, people from throughout the Odisha came here to offer the ‘Podha Peetha’ (a burned-cake made with rice and other cereals) at the cemetery of the Saint and drink the healing ‘Kanjipani’ provided by the mutt. Olasuni temple is only 20 km from Chandikhol and 60 km from Cuttack city. While approaching from Cuttack towards Chandikhol, Kendrapada you need to get down at Bandareshwar Palai Chhak, and take auto-rickshaw for only 2 km journey to the destination. One can approach from Chandikhol and Balichandrapur by hiring a taxi. The nearest railway station to reach here is Cuttack. Lalitgiri, famous Buddhist center of near about 2500 year old. Watch the museum of Buddha statues, pillars and many more. Gangi Hill: Situates in Palai Mouza, it is one of the famous tourist attractions of Jajpur district where you can see the hill-cave. The cave in which Ashwatthama (Son of Guru Dronacharya) concealed during the Mahabharata. Saint Langulibala Ashram: Situates in Bandareshwar mouza. 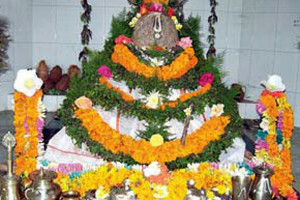 Famous Maha Vinayak & Chandi Temple of Chandikhol. 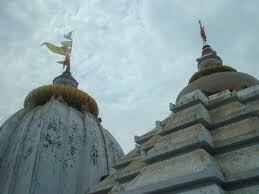 Jagannath Temple of Chhatiabata: 30 km distance from Olasuni; also visit Amarabati Fort nearby. Give Responses for "Olasuni Temple"